Omo Ashe Presents Afro-Cuban & Cuban Popular Dance Workshops!! SEPT 8 & 9!! Don't miss a special weekend of dance with Freila Merencio, former female lead dancer of Havana, Cuba's renowned Raices Profundas (Deep Roots) and former dancer/vocalist for rumba group, Yoruba Andabo! Freila has travelled throughout Latin America, Europe, & Asia dancing & performing and will be teaching & performing in San Diego 9/8 and 9/9. Freila teaches Cuban salsa - No partner necessary! Just be ready to dance! *Sunday classes can be taken individually. Yes, you heard right! Palomar Performing Arts presents Noche Havana. Directed by Patriceann Mead. This event will happen twice with live Cuban music from Agogo Drum and Dance Ensemble and then from La Farandula! (timba band) with an open dance floor. Box Office for ticket purchasing opens on September 6th online, so get your tickets then because both days will fill up. No lie, Patriceanne Mead said this is an annual event and there are some die-hard fans from Palomar College and the local community who attend this each year so don't wait...get them quickly! We hope to get our tickets for the Friday show. What: Noche Havana - Two nights. Same show each night. $10 admission for each night. Tickets need to be bought beginning Sept 6th when Box Office opens. Click here to purchase your tickets online. Where: Palomar College - O2 Performance Studio, San Marcos Campus. Get you dancing feet ready for some fun before everyone goes back to school. This is the last Jazz-in-the-Park concert. This time is Latin music! Come dance to live salsa music this Friday, August 24th, with Johnny Polanco Y Su Conjunto Amistad. We plan to conduct a rueda flash mob at 5:30pm sharp! So if you plan to be there, get there no later than 5:15pm. The song I will use the song "El Que Baila Gana" by Pedrito Calvo Y La Justicia. The lyrics start off saying "Que lo que pasa'qui!?" and that is your queue to get in circle formation and shout in response "EYYYY!". Then Pedrito will say it again, one last time and you should all be in "Tiempo de Espana" position, so make sure you know who your partner is to get in the rueda. This will be the only staged rueda. The rest of the ruedas will be when the orchestra is playing. I will lead a salsa suelta line while they are playing. It's gonna be exciting! I will call basic moves from Tim's rueda class and a few of my own that you all know. We plan to have some of our people there early to grab some grass space and lay out blankets, so if you can come early come find us. I will wear a hot pink t-shirt so you can't miss me!!! hahahaha! What: This is a free concert; You can bring food and libations! Break out that bottle of wine, drink, dance and be merry! So come join us for some good times with our casino family members! ALERT! Yes, I did change the date. It was the 15th, but the Curuye Timba Party is on that date, that is not to be missed. So that said,I moved Casino on Concrete to Labor Day Weekend. Originally we were going to have it in Oceanside Harbor, but the community said lets meet in the middle, therefore, we will go back to Solana Beach. We'll be dancing on AstroTurf, so it will be good for our knees. All are welcome to dance with us! Click here for the GoogleMap link. Special alert! 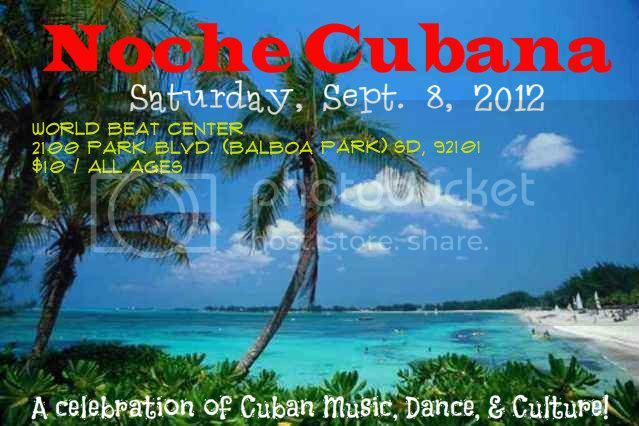 San Diego Afincao will be performing at this next Noche Cubana so come watch the performance we did in Palm Springs. Don't miss out on a great night of Cuban dancing and performances. Juan Carlos Blanco puts a lot of energy and time to give us a great opportunity to get our Timba and dancing fix. CURUYE.COM’s CUBAN SALSA TIMBA DANCE PARTY with DJ SAOCO keepin' us on the dance floor with the best of CUBAN DANCE MUSIC! We’ll be dancing salsa, Afro Timba, reggaetón and more on the covered patio of TRÓPICO de NOPAL. KATI HERNANDEZ is off those crutches and is oh-so-ready to lead us in a sizzling AFRO TIMBA line to her favorite NG song, and people are gearing up for a GENTE de ZONA-HEAD (can you swing your head like Alexander of GENTE de ZONA?) contest! $10 cover. PLEASE NOTE THAT THIS MONTH's PARTY IS ON SUNDAY AFTERNOON! (We'll go back to Saturday nights in the fall!). HELP SPREAD THE WORD! August Casino on Concrete at Solana Beach TODAY! It's that time again to dance at the beach. Come and dance for a couple of hours at Solana Beach in Fletcher Cove Park. By popular demand we are doing a "take two" at this beautiful location. So come ready to dance. Bring a snack and your dancing feet! Let's dance 'til the sun goes down! This is free event and it is family friendly so bring the kids and the abuelos. I'll bring the music and the sound system! Come learn the moves for the flash mob at Jazz at the Park on August 24th. I'll be leading a suelta line. We may have some visitors from other casino families outside San Diego. Let's give them a warm welcome. Timba Night at Kava Lounge On for September! Hi everyone, join us on Tuesday, September 11 at the KAVA LOUNGE and get your Cuban Salsa fill in along with Hip Hop and Cubaton! $5 at door, 9pm till midnight or later. 21 and up. Please help make this a regular monthly event by supporting the bar and buying a drink (or two. they're really yummy and they have $5 drink specials all the time). Brand new jams are gonna be burning off the speakers in September, so don't miss it. Spread the word, ahi na ma!